Impressive tomb in the desert of Iran | Where to next? I’ve always planned that when I fall off my perch, I‘ll be bundled into a cardboard box and burnt to a crisp, but then I saw Tomb of Astan-e-Shah Nematallah-e-Vali in the desert near Kerman in Iran! There’s a park in front of our house in Canberra. The neighbours (and us too) have always worried that this lovely space might be sacrificed for a complex of apartments, but I’m sure a sacrificial new tomb would make a great touristic site. And give the neighbours something wonderful to look at. As with so many of the sights we visit, I had never heard of Shah Nematallah or his tomb. Born in 1330 in Aleppo Syria, Nematallah (there are a whole bunch of slightly different spellings of his name) was a Sufi master and poet. In his younger years, he travelled throughout the Muslim world, studying under different philosophers and searching for a spiritual leader. He ultimately became a disciple of Abdollah Yafe’I in Mecca. 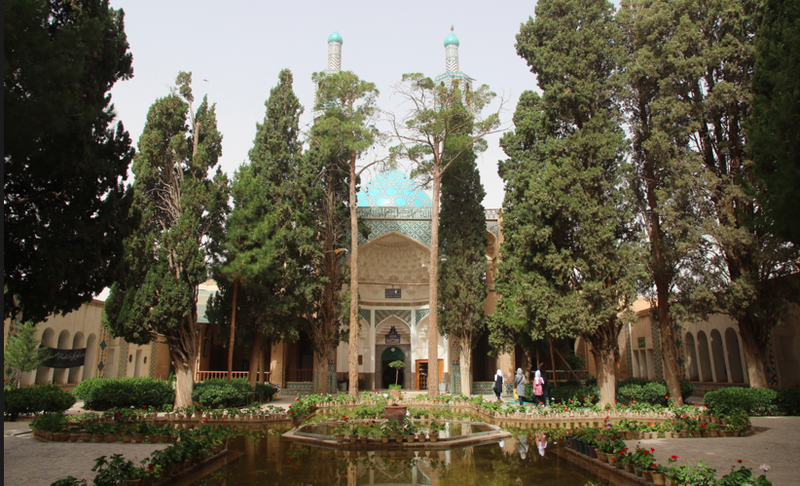 He went on to settle in Samarkand and finally in Kerman, in southeast Iran. He is considered to have established the Nematallahi order of Sufism. This order has now declared itself Shia Muslim. By the time Nematallah died in 1431, his fame had spread across Persia and India. His tomb, in fact, is under the authority of Achaeological Survey of India. I reckon few tourists make it to Nematallah’s fabulous tomb and surrounding gardens. That’s a pity. We made a special side trip to visit, and I’m so glad we did. The complex was built in the 15th century and is about 35000 square metres in area. Now we just have to convince our kids to squander any inheritance they might receive on a Canberra version of such a tomb. The park out the front of the house would be just the right size! Must be a Nebraska thing: I always told people to toss my carcass out the door along Nebraska Highway 2, somewhere in the Sandhills, and let the coyotes clean up my remains! LOL! 🙂 I’m sort of serious! It’s a good thing to be sort of serious about. Peggy, it’s magnificent! I’ll go with you. You mean to the tomb in the park out the front of our house?